Last night, my collaborator and I were featured on the Google+ program Teachers Teaching Teachers to talk all things sound, community literacies, and connected learning. Across the larger broadcast we talked through the many phases of #hearmyhome, detailing how it was at once a grounded project in classroom and community spaces, while simultaneously operating as a networked collaborative that invited participants to earwitness culture and community through eight sonic events. We helped shape the soundscapes of the everyday. In the penultimate minutes of the program, the moderators asked us to consider metrics of achievement. “How would you qualify success for the project?” Eagerly, I started talking numbers. “We had over 100+ unique participants! We saw how modes connected, overlapped, and caused disjuncture in how we came to configure ‘home.’ We had participants across the globe, from East Lansing, MI to Australia.” Reflecting on my response, another language and literacy researcher, Ian, asked me to move beyond the numbers. “But what did you learn?” he asked. As I reflect on the #hearmyhome project, and the Cultural Heritage Informatics Fellowship in particular, I want to highlight how at a macro level, the projects that emerged from our shared community of fellows are exemplars of connected learning. Refracted through our varied interested in cultural heritage, we designed opportunities for engagement in powerful, relevant, and engaging ways. The affordances of the digital only augmented these visions and aided in the creation and building that occurred. Our learning was participatory, networked, and experiential. At a more micro level, #hearmyhome exemplified that some of the most meaningful forms of learning happen when a learners have interests or passions they are pursuing across contexts of (inter)cultural affinity and social support. The group operated with a shared purpose. As a model for connected learning design, #hearmyhome offered a way of connecting the spheres of home, school, and community-based learning to leverage the affordances of digital and networked media. We met friends through #CLMOOC, collaborators with the team at #walkmyworld, and even had cheerleaders amplify the project at Sounding Out! In total, the modes, meanings, and metrics of success were larger than the decisions of design and/or series of sonic interactions. Sustained teaching and learning and engaged user participation was the result of making our process open. As we close out the year here in LEADR, I know many of us would agree that at the core of the work we accomplished this year, our vision was guided by more equitable, social, and participatory forms of learning across our fields and disciplines. Through production-centered and open forms of cultural heritage informatics, we each engaged in relevant, hands-on, and innovative forms of design to fuse our own intellectual interests with digital experiences. Success, then, isn’t the completion and release of our individual projects, or the statistics and benchmarks of how many users, lurkers, and learners visit your site, but the behind-the-scenes process and sustained engagement of open learning. As I have mentioned in previous Blog posts for the CHI, the Namibia Digital Repository contains two main endeavors. First, it is a digitization project; countless hours have been spent standing in front of scanners digitizing books and papers, and many more have been spent setting up VHS players to record to hard drives. I have described the process of digitization in a previous post on 29, January, 2016. As I’ve put this project together over the past several months, I’ve spent a great deal of time thinking about the ideal shape of a digital archival. The more time I spend with the audio reels that form the base of my archive, listening to them over and over as I digitize and transcribe them, the more I feel they deserve to be presented with as little intervention as possible. To this end, my website has evolved into two fairly separate entities. On one end is the archive, where the collection of audio reels will eventually be reproduced in total with as little narrative intervention as possible. On the other end is the mediated environment that I have been referring to as the “galleries,” where I will publish short interpretative essays that situate the audio reels within their various historical contexts. The Cultural Heritage Informatics Initiative invites applications for its 2016-2017 Cultural Heritage Informatics Fellowship program. The Cultural Heritage Informatics Fellowships offer MSU graduate students in departments and programs with an emphasis on cultural heritage (Anthropology, History, Art History, Museum Studies, Historical & Cultural Geography, Classics, etc.) the theoretical and methodological skills necessary to creatively apply digital technologies to cultural heritage materials, challenges, and questions. In addition, the fellowships provide graduate students with the opportunity to influence the current state of cultural heritage informatics and digital heritage, and become leaders for the future of cultural heritage informatics. In the past few weeks Autumn and I allowed some of our friends and family, with varying levels of archaeological experience, to view the site to see if it is user friendly. With some of their constructive comments, we first added some language to the intro pop-up to better explain our map page. We added language to our intro pop-up to explain how to toggle through the layers. BARDSS will allow scholars of Atlantic slavery to access data on hundreds of thousands of individual African slaves and their descendants who lived and died in Latin American slave societies. The quantity of data in BARDSS means that historians and social scientists will be able to use baptismal records as a kind of census, opening many possible avenues for research. One exciting possibility for historians of the slave trade is to employ BARDSS data to fill gaps in our existing knowledge of Atlantic slave trade patterns. One cannot understate the impact of the Trans-Atlantic Slave Trade Database on our understanding of the Atlantic slave trade. However, due to the fragmented nature of the sources, the data is often quite incomplete. For example, out of the 910 transatlantic slave voyages that arrived in Cuba from 1789 to 1820, during the era of the legal slave trade, the Trans-Atlantic Slave Trade Database can only tell us the African region of embarkation for 239 (Fig.3). Thus, the African origin for nearly three-quarters of the Cuban transatlantic slave trade is a puzzle. However, by examining the contents of BARDSS’ Origin attribute, we can begin to assemble the missing pieces and complete our picture of African forced migration to Cuba. Churches usually baptized African slaves soon after their arrival in the Americas, and, as noted above, the vast majority of these slaves were identified as belonging to an African nation. While these nations may not have corresponded to contemporary African polities or ethnic groups, they correlated closely with the different African coasts where slave ships embarked their captives. For the year of 1808, for example, the Trans-Atlantic Slave Trade Database contains information on seven slave ships landing captives in Cuba. Of these seven, one arrived from the Bight of Biafra, one from the coast of present-day Sierra Leone, and the other four were of unknown origin. By looking at the baptisms performed in just one church in Havana, Espiritu Santo, during 1808, we can begin to make educated guesses about the unknown embarkation regions of the remaining two ships. 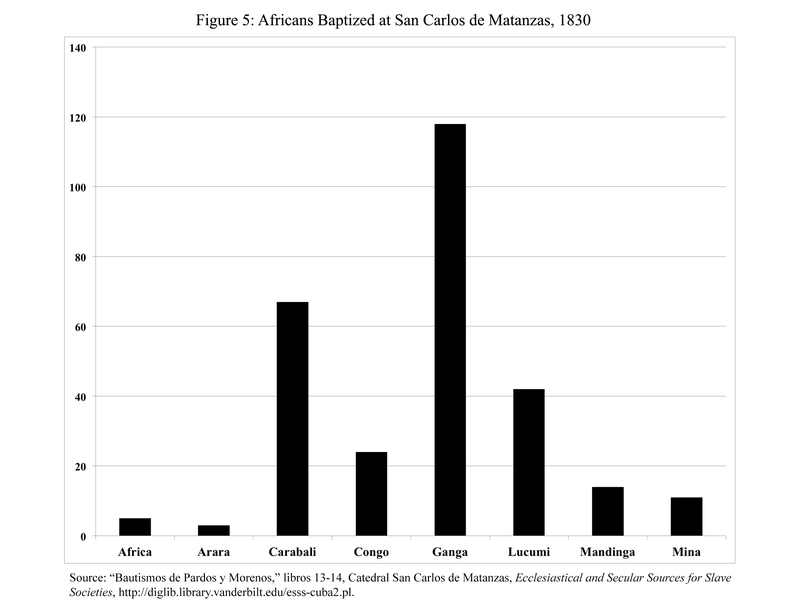 Surprisingly, a plurality of the African slaves baptized in the Church of Espiritu Santu were identified as Congo, a national origin corresponding to a sprawling region of West Central Africa (see figure 4). We can be fairly certain, then, that at least one of the two ships took on slaves along the coast of present-day Angola and Gabon. BARDSS’ ability to tell us about the African origins of slaves in the Americas is even more crucial for the era of the illegal slave trade, which continued on a large scale in nineteenth-century Brazil and Cuba. Smugglers of slaves, hoping to cover their tracks, rarely left behind detailed itineraries of their illicit voyages. In many cases, details about illegal slaving voyages are only known thanks to the interdiction of mainly-British naval vessels tasked with hunting down slave ships. In 1830, Matanzas was a thriving center of Cuban coffee and sugar production–industries dependent on the labor of enslaved Africans. For historians interested in learning about the African origins of the slaves working Matanzas’ cafetals and ingenios, the Trans-Atlantic Slave Trade Database is a poor source. It contains information on only one ship, the schooner Santa Rosa, which in 1830 unloaded slaves of unknown origin in Matanzas. What little Slave Voyages can tell us about this ship comes from the records of British officials tasked with the slave trade in Cuba. However, the baptismal records of the San Carlos Cathedral in Matanzas tell a different story. In 1830, 284 adult African slaves were baptized at San Carlos. 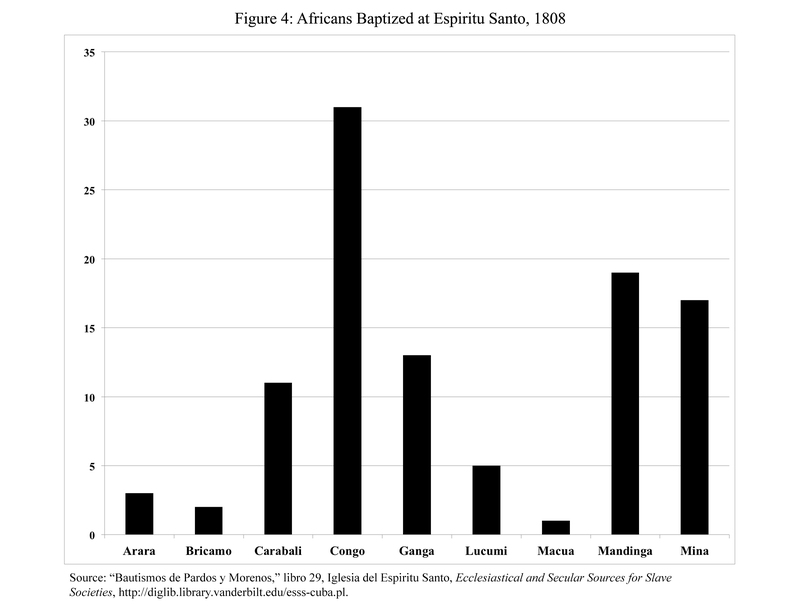 They belonged to more than seven different nations corresponding to every major slave trading region on the Atlantic coast of Africa (see figure 4). Clearly these individuals could not have all arrived on the Santa Rosa. Instead, the Matanzas slave trade appears to have been wide-ranging, with slave ships bringing captives from Upper Guinea and Sierra Leone (Mandinga and Ganga), the Bights of Benin and Biafra (Arara, Carabali, Lucumi, and Mina), and from the coast of Central Africa (Congo) (Fig. 5). BARDSS’ utility is not limited to studies of the Atlantic slave trade itself. After all, African slaves baptized as older children or adults comprise only a portion of the entities included in the database. In many circumstances, the majority of baptized individuals were newborn infants, whose parents’ names (often including ethnonyms) and birthdates were recorded by the priest performing the baptism ceremony. This allows historians a glimpse into the intimate lives of enslaved people. For example, the archives of San Carlos in Matanzas record 368 infants born in the year 1830–a frequency of 1.01 per day. By month, the number of births ranged from a low of 22 in August to a high of 38 in October. Adjusting for the length of each month, the frequency of births ranged from 0.71 per day in August to 1.23 in September–an increase of 73 percent (see figure 5). 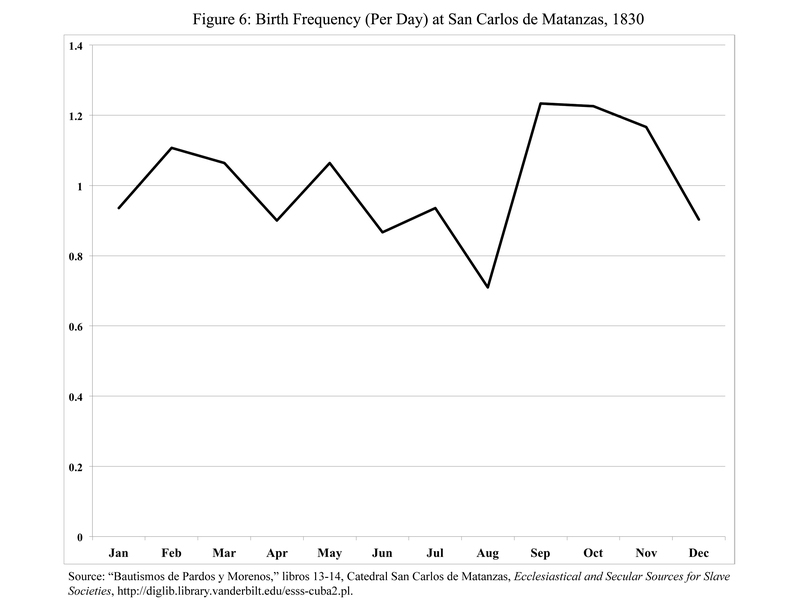 What might account for the steep decline in Matanzas births during the summer of 1830 and the dramatic rise in autumn? With BARDSS, a inquiring researcher would be able to compare birth rates from one year to the next and across geographical locations in order to determine whether and where this pattern was repeated. If so, he/she might begin to identify environmental, social, or economic explanations for this pattern (Fig. 6). Needless to say, we cannot give a full accounting here of the possibilities BARDSS offers for historians, social scientists, and genealogists. As with any source, the informativeness of baptismal records depends on the questions researchers ask of them. BARDSS can tell us about much more than baptisms. It contains data on locations, dates, children, parents, priests, slaves, slaveholders, free people of color, the African slave trade, and more. As described above, BARDSS data can be used alongside those of other online databases to fill gaps in our knowledge of the past and answer important historical questions. As Nikki and I finish up the final touches on the Mapping Morton Village site, I focused on user interaction and navigation. One aspect of our site that we knew we wanted to include was an automatic (on page-load) popup modal to give an introduction to our site, see image below. Robos on What is your purpose?